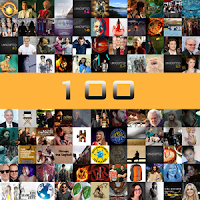 Home » » HG Fireside Chat's 100th episode! HG Fireside Chat's 100th episode! For those of you who don't know (who?! ), Fireside Chat is a weekly podcast broadcast live on Monday nights discussing everything to do with The Hunger Games. Earlier this week they celebrated their 100th episode. Anyone who missed the episode can catch it here, or download the free podcast on iTunes. Quarter Quell would like to say a huge "congrats" to everyone involved in Fireside Chat for their fantastic achievement. Go check out their site here.